The box comes with a card detailing all the items included with retail values. 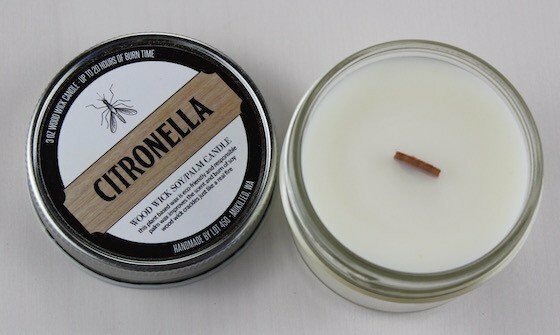 This is a soy/palm wax candle, and it has a wood burning wick! We can always use more outdoor candles, and I hope this wooden wick one has that crackling sound I love! This cleanser seems to have spilled just a little in transit, but it’s still almost full. I just sampled it, and it seems gentle like the product description. And it isn’t a lathering cleanser – you massage it on then wash off. This may be my favorite item in the box – it is a blend of Oregon Lavender, Sweet Orange, Lemon and Sandalwood. You can use it as a face, body and/or room mist too. This is a mix of dried organic garlic, onion, black pepper, rosemary, basil, oregano, and chili. It smells really good, and even though it is labeled for grilling, I think this will be a useful mix all seasons. Unfortunately for me, this sauce doesn’t have any ingredients/nutrition facts listed. (I thought that was required on full-size food products?) I couldn’t find the ingredients online either – if you find them, please let me know! Poke holes in the front and the back of the bag; soak in water for 2 minutes; set in a foil tray; slip in a smoke box or on the grille grate; when it starts to smoke, add whatever you’re cooking. Perfect for meat, poultry, fish, and vegetables. Solid Maple Wood Muddler – Value $24.95? This is the price listed from the card – it seems a little high to me, though. Verdict: This box has a value of about $90 (using their info card pricing). I really like the item selection this month. I think my favorite items are the mist and the candle, and I’m looking forward to using the spices and Bag-Of-Smoke. What do you think of the July 2015 Prospurly box? Oops! Copy and past fail on my part! 🙂 Fixed – thanks! I think the theme might have been bonfires and barebeques, not a seaside excursion. 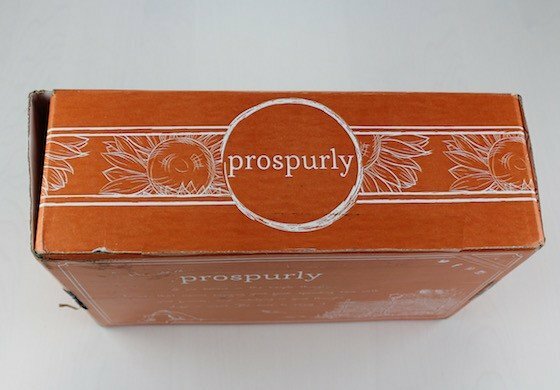 The June box is still available for purchase (for $40) on the Prospurly website. That makes me less motivated to subscribe, because waiting to see what’s in the boxes can potentially save me $10. But I also remember that the April box, which I loved, sold out really quickly on the website after blog reviews for it came out. This is the first month Prospurly is a bit of a miss for me but only because I live in a studio apartment in NYC so have no use for outdoor candles and grilling stuff. Oh, to have a yard again!! I still love the curation and hopefully I can gift or swap the candle and the bag of smoke. I’ve been watching this one and have liked past boxes, but this month probably wouldn’t have been for me. I liked the first three items but I don’t do grilling or BBQ and I don’t drink cocktails. And “smoke” flavor is not something I enjoy (in fact, quite the opposite). Oh well. That’s why I’m glad for reviews on MSA — takes a lot of the risk out of box purchases.